Building your own private villa in Crete is easier than you might think. Since 2003 Kreta Eiendom have been constructing private villas through our own construction company. Once you have decided on your house, Kreta Eiendom will prepare the construction contract with a fixed price for your house, ready for you to put the key in the door. We will handle all the legal requirements relating to the completion of the house. Our standard delivery time for a private villa is approximately 12 months from the day the building permit is granted. Build with us to meet your wishes and to design your villa in the perfect location on Crete. We provide key ready villa whether you want to build a house for your own use or for an investment with a maximum return, we set your needs and principles at the forefront. The Kreta Eiendom team will assist you during the complete building project, from the acquisition of the plot, the design and development to the construction and delivery of the house. The choice of the plot is the most essential part of the building project. We offer you a wide and varied range of building plots based on your wishes like location, view, facilities in the area and your overall budget. On the basis of the choice of the plot and the further listing of your specific wishes, you will meet our architect that offer many pre-designed houses with detailed drawings which you can choose from or you can choose to have your dream house designed according to your own specifications. The architect will start working on your villa and will present it with detailed layouts and realistic 3D photos. In accordance with the contract, we will provide you with a detailed building description and regular progress reports. During the construction process we will keep you informed about the progress of the work through photographs and messages. 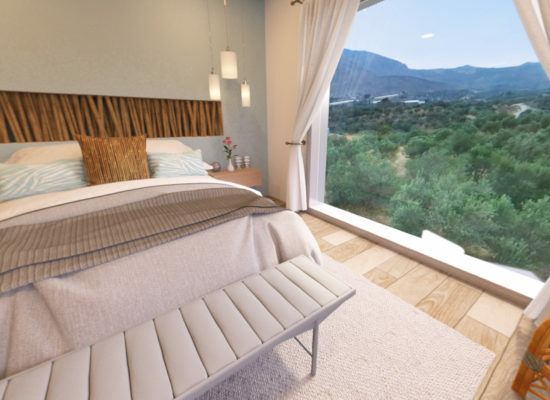 Your house in Crete is not complete without a perfect matching interior to your new home. We can take care of the full interior design and styling for you. We can completely custom make, based on your personal style, needs and budget, your home with furniture and decoration. Do you wish to build a house for investment purposes? Then we can, with our years of experience and knowledge of the current Greek property market, offer excellent service in the development of your project. We focus on the return of your investment and in the development of your project and take into account the needs of today’s discerning international buyer. The right choice of the location, an optimal layout of the house and careful choice of materials and facilities are of paramount importance to gain the right audience. Kreta Eiendom’s team is always dedicated and devoted to superior quality and results. We think that the building process has to be full of joy and expectations and also help you achieve the best result without getting stressed when you are not present.